From tradition to a “new standard” for the future. The development process began by gathering the best of Amati Homage and Amati Anniversario: an aptitude reflected in the particular attention given to the choice of drivers and the following optimisation of their membrane composition. 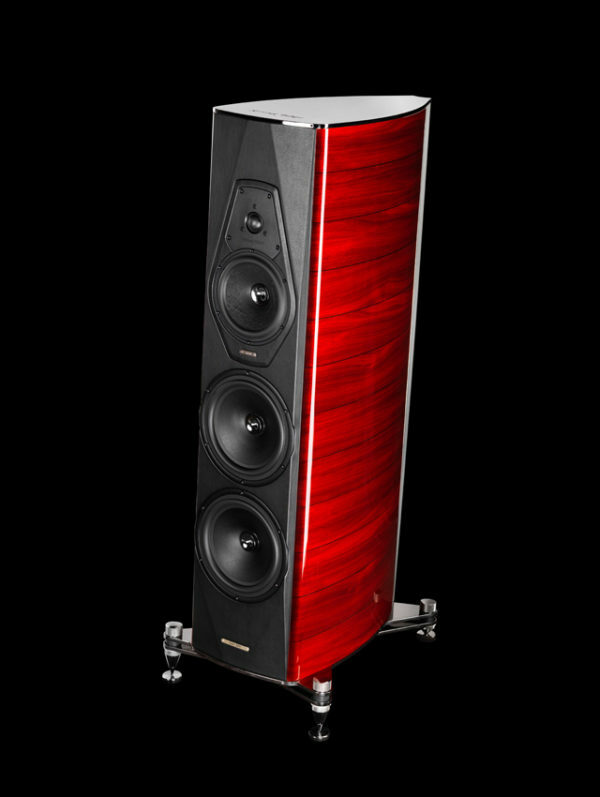 The next step was to take advantage of the most recent Sonus faber technology, both in terms of innovative loading systems and in terms of the newest filtering systems, arriving at the implementation of a differential distribution of the low frequencies. The new and original nature of the design architecture forced us to carry out a radical redesigning of the acoustic case that, while it defines itself in its structure and the distribution of volume, it takes advantage of innovative solutions linked to the combination of different materials, thus exalting the proverbial virtue of the violin shape. The new project confirms and modernises another strong foundation of Sonus faber: a musical instrument lives within an environment and becomes part of it, carrying out the functions of both musical source and furnishing. The design choices, the finishes of the new materials, the enhanced quality of manufacture and the extreme attention to every little detail are equal to the sound output, the exalting of this concept and the testimony of our perennial values are not only firmly rooted in the present but they look towards the future. Amati futura aspires to be an expression of tomorrow. A new standard made possible through the patented technical solutions gathered through the years that have brought us to the creation of our flagship (“the Sonus faber”). The Exo-Squeleton clamp is implemented by the 2 CNC machined avional nickel-plated end-covers (on the top and on the bottom of the cabinet). Their role is to control and constrain residual resonances of the enclosure walls. The two end-covers are linked by the dual avional rear wings, functioning as a high speed mechanical interface that conveys spurious vibrations to the base of the cabinet. A Tuned Mass Damper, with multiple tuning frequencies, like on record skyscrapers and F1 cars converts the residual vibrations into heat (thermkinetics) by out-of-phase vibrations. The Stealth Reflex is the Sonus faber patented solution to implement a para-aperiodic vented system. Besides enabling to reduce the dimensions of the cabinet, better low frequency and lower distortions are reached. It has also the advantage of eliminating the port noises typical of classic bass-reflex systems. The speaker system is mechanically decoupled from the floor by the patented L.V.T. system (Low Vibration Transmission). This is an elastomer based suspension system to substantially reduce transmission of spurious vibrations to the listening room; also acoustic feedback phenomena are inhibited. The cabinet is the highest expression of the Lute shape design. The progressive curvature walls, made out of cross-grained okume multilayer plywood, are technically implemented in a constrained layer damping fashion. The acoustic ambient of every transducer has been designed to come as near as possible to the theoretical optimum. Specific stiffening ribs are strategically engineered in each acoustic sub-enclosure. Sound absorption has also been taken care of with utmost precision, by selecting the right material for every application and location, from open cell foamed thermoplastics to fibrous materials, akin to the felt used in pianos. The dual 9” woofers have been designed to get the best possible definition in their passband, while eliminating the usual coloration and resonance problems of metal cones. The solution has been to use AlMg cones in a layer-damped structure by damping the cone with triple foamed closed cell high hysteresis elastomer structure. 3.5 way, low spurious vibration optimized suspension, stealth reflex para-aperiodic loading, staggered low frequency floorstanding loudspeaker system. Lute shape design, multilayer, constrained-mode damping, enclosure formed using hand selected wood layers, quality graded and oriented for carefully optimized resonances control. Sub-structural ribs are strategically placed for absolute rejection of spurious vibrations. New Era avional (from the “the Sonus faber” experience) exo-squeleton clamp structure with the Tuned Mass Damper inhibiting the residual resonances of the wooden structure. 29 mm ultra dynamic linearity classic Ragnar Lian moving coil driver, Sonus faber vibration optimized mechanical interface. 179 mm, ultra dynamic linearity driver. CCAW/Kapton eddy current free voice coil. Dynamically linear magnetic field motor incorporating triple Kellog/Goeller rings. Real time air dried and non pressed cellulose fiber cone. Designed synergistically with its optimized acoustic chamber. 220 mm, lightweight elastomer foam damped Aluminium/Magnesium alloy cone driver in an acoustically amorphous stealth reflex chamber. A long-throw motor system with a 1,5” controlled eddy current voice coil is implemented for high speed, performance and linearity. Special coaxial anti-compressor are used, designed to remove cavity resonance and distortions. Non-resonant progressive slope design, optimized amplitude/phase response for optimal space/time performance. Paracross topology on the tweeter hi- pass. The response at low frequencies is controlled for a clear amplifier friendly performance. Dual staggered transfer function low frequency/ room interface optimized filtre. Highest quality is used in terms of the components: Mundorf Supreme capacitors, Jantzen inductors. Crossover: 80Hz – 220 Hz - 3200 Hz. POWER HANDLING 30W – 300W, without clipping.